Thank you to everyone who visited our booth at NRF this year. We were thrilled with the conversations we had and the opportunity to connect with like minded brands, retailers and partners who have big, innovative ideas for commerce. More than anything, we are really excited about the opportunity to make these big ideas a reality in 2019. For me, the overwhelming take away from the event was the blurring of online and offline. Previously, these channels were siloed -- and teams, software, hardware and projects were siloed right along with it. This is quickly breaking down as the focus shifts from optimizing individual channels, to making engaging, seamless, relevant and personalized buying experiences for customers - whether they’re on their couch or in the dressing room. Along with this trend, channels are borrowing concepts from each other and reimagining them in new ways. Digital channels are embracing personalized support, chat tools, sizing help and other engagement tactics that were previously reserved for the store. Physical channels are experimenting with mobile applications, social sharing, and other technologies that were previously “owned” by eCommerce teams. Payments, in particular, is getting a lot of attention - specifically how to make it as fast and frictionless as possible. Self checkouts, grab and go, digital wallets, personal device checkout, flex retail solutions and many other related technologies were well represented at the expo and in the sessions. I think the turn in 2019 will be that these technologies shift from concept to reality. Customers are ready for this tech and retailers are rightfully in a hurry to make it available - either on their sites, in the store, or other experimental channels. More than ever, there’s a need for technology that is pliable and fluid enough to adapt to address the requirements of buying experiences that are less defined by a destination, and more so by the use case and the buyer herself. As a product owner, there’s nothing more satisfying than solving a problem for a customer, and I left NRF confident that we are in the right space with the right solution. So many of the amazing brands and retailers have been frustrated by trying to stretch their existing legacy systems to address these new use cases - and unfortunately many have been unsuccessful at this point. 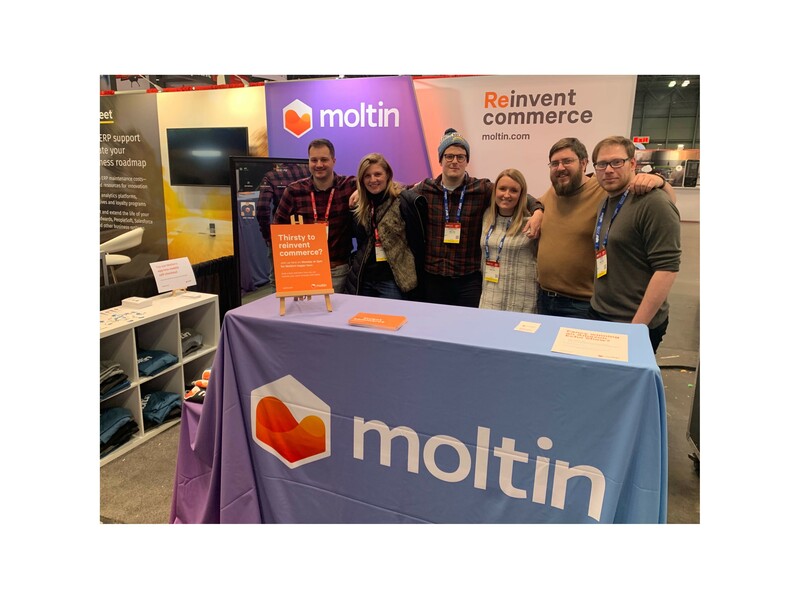 The Moltin team is excited to relieve this pain in 2019 and help brands and retailers create exciting new experiences that will draw customers in and make buying frictionless.